The ancient Egyptians believed their pharaoh’s body had to remain intact in order to reach the afterlife, so they took elaborate steps to ensure the ruler’s body would not decompose. The Egyptians developed a special embalming process called mummification. Embalming is the technique of preparing a body so it can be preserved. Only the pharaoh and his closest advisors were mummified because the ancient Egyptians believed only gods could live in the afterlife. Poor people were buried in the desert, where the hot dry sand quickly dried out their bodies. The most elaborate Egyptian mummification process took about 70 days and included great ceremonies. Embalmers cut the body on the side to remove the intestines, liver, stomach, and lungs. They wrapped the organs in linen and stored them in sacred Canopic jars. The Egyptians believed different gods would protect the organs in the afterlife, so the lids of the four jars depicted the animal associated with the guardian of that organ. 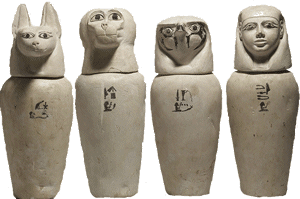 The Canopic jars were safely stored so the pharaoh could use his organs in the afterlife. There was no jar for the heart. The Egyptians believed the heart held the pharaoh’s soul, so the embalmers left that organ inside the body. The Egyptians did not understand the importance of the brain, so priests removed it by inserting a special hook through the nostrils. The hook was swished around, allowing embalmers to remove the mummy’s brain through the nose. The pharaoh’s mummified body was stuffed for about forty days to drain any fluids. When the stuffing was removed, the body was very dry and smaller than in life. It was again stuffed with packing and covered in jewels. As a final step, the mummy was wrapped in about twenty layers of linen. Many of the pharaohs were buried in a set of nesting mummy cases and elaborate stone coffins called sarcophagi. When a pharaoh’s mummy was complete, a priest would touch the mouth of the mummy with a stick so that the pharaoh could breathe and speak in the afterlife. Mr. Donn has an excellent website that includes a section on Ancient Egypt. 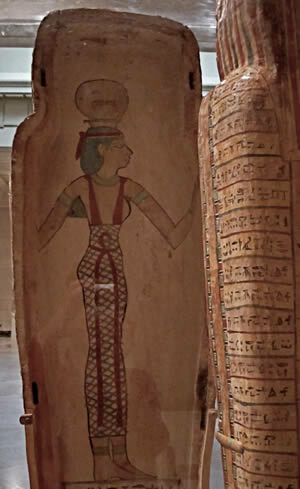 This 85-inch coffin is nearly 3000 years old. It is on display at the Toledo (Ohio) Museum of Art. The remains of one of six people who died in Gebelein, Upper Egypt about 5500 years ago. The dry sand preserved their bodies so well that in one case we could see that he had red hair. The ancient Egyptians preserved the organs of their pharaohs in canopic jars that were carved from limestone or made of pottery. © mrdowling.com. All rights reserved.